"Superior accuracy verified by independent organizations and companies worldwide, including METEOMET"
First in precision. First in sensor protection. Cures the leading causes of air temperature error. Patented and registered design is one-of-a-kind and offers many benefits for your air temperature and humidity measurements. Easy to install and not affected by dirt accumulation, it is the elegant solution for professional WMO certified air temperature measurements. Accepts sensors up to 25mm diameter. More accurate than even professional fan-aspirated solar shields and screens in a comparison by the Royal Meteorological Institute of Belgium. (“Intercomparison of Shelters in the RMI AWS Network”). Not only does it offer best protection from the sun, but also protects your sensors from driving rain, dirt, sand and dust better than multi-plate and most fan-ventilated shields, to extend your sensor life. More accurate than all multi-plate shields in the sun, rain and snow. More accurate than fan-aspirated shields. Keeps sensors clean longer & accuracy is not affected by dirt. Just like in the eye of a tornado, the centrally mounted sensor remains clean. Internal vortex of the helix forces heavier than air particles like dirt, sand, snow and water naturally away from the sensor. Looking through the side of the helix, one quickly realizes why air organizes into a spiral vortex. Vortex flow promotes fresh air movement to the sensor for superior accuracy in air temperature and humidity measurement. Keeping your sensors clean and hidden from the sun is the job of a radiation shield. Superior water shedding and not being attractive to insects and spiders due to its ever slopping surfaces is a great feature only the helical shield has. Less trips to the field. Reduce your maintenance because sensors stay cleaner, improving long-term measurement stability, accuracy and reliability so you can rely and trust your data. Keep your sensors running longer in Agriculture. By rejecting dirt to the outside of the internal spiral flow, your sensors stay cleaner longer. By protecting them from the sun and heat from the ground, your sensors are more accurate. Grow of business with quality data. Accurately verify temperature dependency of your PV panels. Collect reliable and accurate temperature data unaffected by sun reflection, heat radiating from your PV panels, the ground and nearby building walls. Rely on good data to optimize your PV power output. Optimize your output based on reliable data. Not affected by radiating heat from city walls, pavement, and sun reflections, real-air-temperature measurements are a reality with the MeteoShield. Urban climate research with WMO accuracy in a dense urban environment is now possible. Learn to trust your data. Cleaner longer lasting sensors. Let the shield catch the dirt, dust, sand, winter snow and salt spray, not your sensors. Reduce your weather station maintenance, increase your sensor life and measurement accuracy. Reliably measure or calculate dew & frost point. Reduce risk of temperature related accidents. Reliably eliminate albedo temperature error over snow pack and glaciers on sunny days. Protect your sensors from driving snow, freezing rain and achieve fast sensor response after rain. These are trademarks of the MeteoShield. Stabilize your measurements over snow. In road and highway weather station applications, MeteoShield protected sensors more effectively than multi-plate and fan-aspirated shields, leading to more accurate temperature measurement. Summer testing has shown that even black paint has little effect. Air temperature measurement inside the helical MeteoShield Professional is stable and accurate even when painted black. In a winter sensor comparison by an independent organization METEOMET, MeteoShield Professional outperformed all passive radiation shields and even most of its fan-ventilated counterparts. HOW ACCURATE IS THE METEOSHIELD? Independent comparison by the Royal Meteorological Institute of Belgium. Intercomparison of Shelters in the RMI AWS Network - a long-term research study comparing the MeteoShield Pro with fan-aspirated Stevenson screen and a fan-aspirated radiation shield. 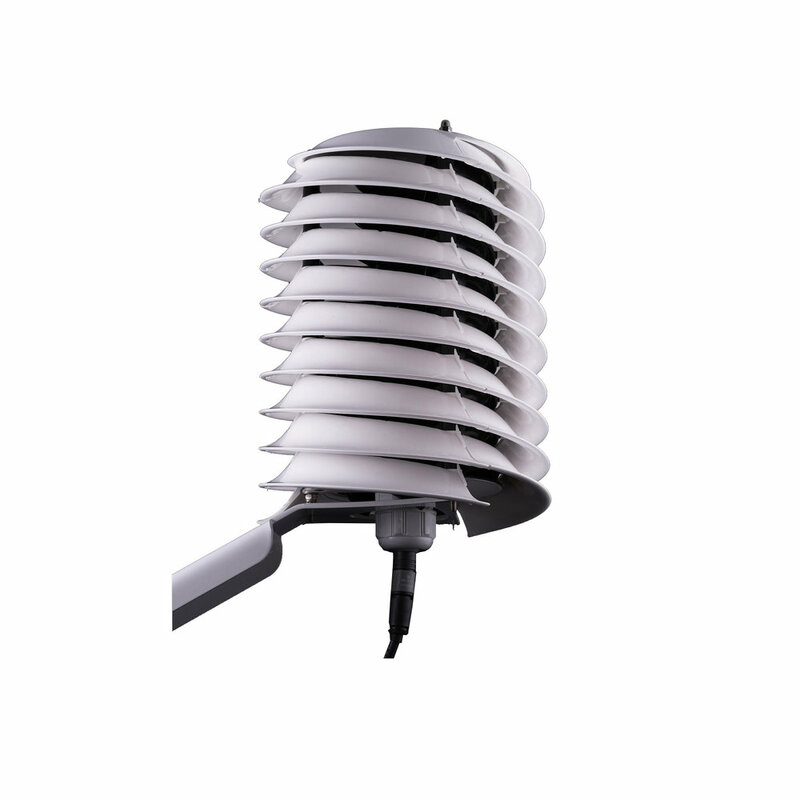 Maximum temperature at low wind speeds of weather station radiation shields from an independent study by microstep mis. White powder coated 2.5 mm stainless steel for for all-weather robustness. Illustrations show different mounting options using u-bolts, screws or Bandimex stainless steel band mounting system. Customization available for orders of 20+ radiation shields. for hanging applications such as in agriculture and green houses. Stainless steel frame with hydrophobic and UV stable plastic double-louvers molded from dual-color plastic for durability and environmental toughness. Double-helix & double-louver design for superb rejection of external influence on air temperature creates a strong dirt rejecting vortex. Customizable height to fit sensors of any height upon customer request. Based on real world testing in road-side installations, soiling and dirt buildup on the helical MeteoShield do not have an affect on measurement accuracy. Even though dirt buildup will provide no measurable reduction in temperature accuracy, dirt, dust or sand accumulation on the plates and bracket can be cleaned with soap and water. MeteoShield features a clean flowing design reminiscent of swirling flows and sea shells as found in nature. The unique continuous 27 piece double-helix spiral design is one-of-a-kind in the marketplace and serves a well deserved purpose in achieving superior measurement properties and unsurpassed sensor protection.